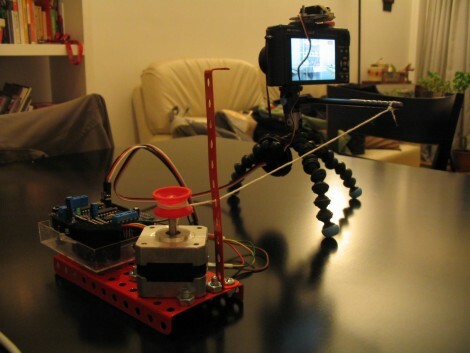 Here’s a simple camera setup that lets you make your own panning time-lapse videos. It uses a couple of motors driven by an Arduino to snap successive still images which can later be rolled into a video format. [Acorv] was not thrilled with the fact that his new Lumix LX5 didn’t have a time-lapse option built-in. But luckily it does have a standard connector on top for an external flash. He saw on a forum post that someone had built a jig which mounts to the flash bracket and uses a servo motor to depress the shutter release button. He recreated that and had half of this hack done. The panning portion is facilitated by the Gorillapod. This particular model offers a swivel feature. This is automated by connecting it to a stepper motor with a piece of string. As the stepper turns the string is wound on a spool and gradually pans the camera. Simple, and it seems to work great. Check out the video after the break to see a test which was shot at sunset on the shores of a lake. If you have a camera which offers an IR remote shutter release the time-lapse portion can be handled with an IR intervalometer, making the mechanical build a bit easier.